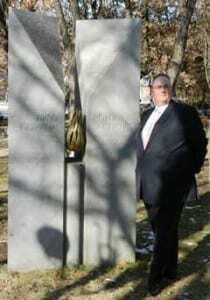 A NSW State Labor MP has visited the Holocaust Memorial in Armenia. On a recent visit to the former Soviet Republic of Armenia, State Labor MP, Mr Walt Secord officially visited the Holocaust Memorial in the capital city of Yerevan. Mr Secord said the site is in Metzarents Park on Moscovian Street, in Yerevan and was erected by the Yerevan Jewish community. Mr Secord was in Armenia on a short visit. He also visited the National Armenian Genocide Museum and met with Armenian politicial leaders. Mr Secord was elected to State Parliament in May and is deputy chair of the NSW Parliamentary Friends of Israel and deputy co-chair of the NSW Parliamentary Friends of Armenia. I am hopeful that one of these days leading Jewish organizations, such as the ADL, and Israel will recognize the genocide of Armenians. Many people don’t know that it was the precursor to the Holocaust. In fact, many German soldiers serving in the Turkish army during WWI, learned from Turks how to go about eliminating a whole nation. In the ’30s it was Jewish-Austrian novelist, Franz Werfel, who helped publicize the genocide of the Armenians. Within a decade, Raphael Lempkin, a Jewish-Polish jurist, coined the word “genocide” to describe what Turkey had done to the Armenians. And much earlier, during the genocide, Henry Morgenthau, the Jewish-American ambassador to Turkey, protested to the Turkish leadership to halt the extermination of the Armenian minority. The Turkish rulers ignored him. Now the Jewish community and Israel should not ignore the historic fact of the Armenian Genocide because of political expediency. Its time the Australian Jewish Community reaches out to the Armenian Community in Australia and shows our support. To our shame for many years there was a fear to do so lest we upset the Turks.I think the time has come to let that go and recognise the Genocide perpetrated on the Armenian people by the Turks and give it the proper recognition it deserves!